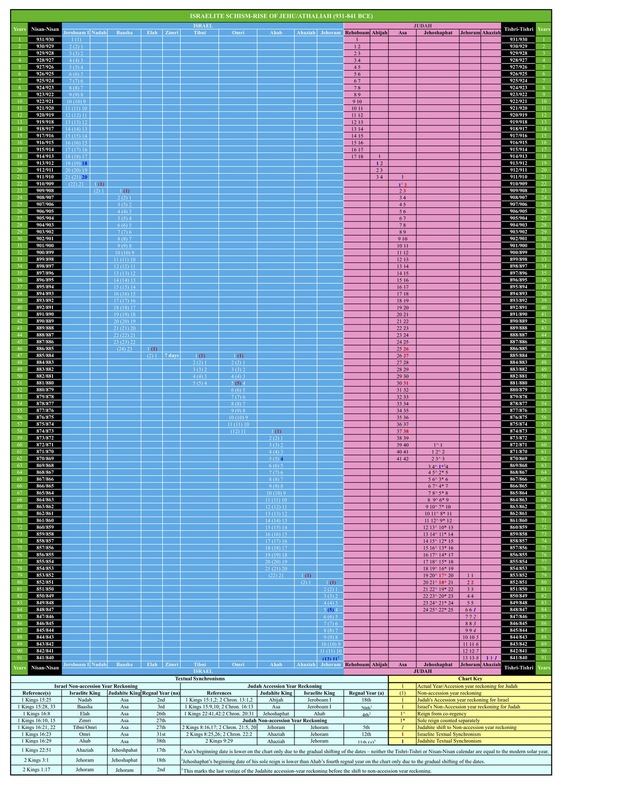 The following chart graphically illustrates every single, solitary regnal year of the kings of Judah and Israel from the beginning of the Divided Kingdom (931 BCE) to the end of the Omride line (Israel) and the death of Ahaziah of Judah (841 BCE). Its primary purpose is to show the unwavering consistency of the authors of Kings and Chronicles in their recounting of the reigns of the southern and northern monarchs. Quite simply the accuracy is astonishing. 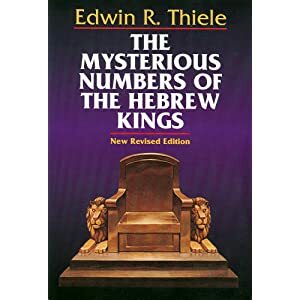 The dates within the chart are based on a synchronized chronology that was first fleshed out by the great scholar, Edwin Thiele, in his groundbreaking work The Mysterious Numbers of the Hebrew Kings (the only chronology "must own" book for every OT student and teacher - recommended here by Todd Bolen). Thiele's conclusions are best summed up by the recently deceased scholar, Anson Rainey, who said, "Nobody can discount Thiele's dates because quite simply his dates work and nobody else's dates work." That is the great chronological check - does the chronology actually work? Despite many recent alternative chronologies - Thiele's now over fifty-year old theory still checks out. The chart below has some value in that it can be used as a guide to Thiele's chronology. It allows one to look at the entire landscape of 90 years of Israelite history on a single page (albeit a very large page) while providing the onlooker the ability to compare any given king with his contemporary (I loathe not being egalitarian and using "their" but Athaliah just missed the list). This chart is especially helpful in making sense of some problematic chronological passages. For instance, in the reign of Jehoshaphat (873-848 BCE), the writers of Kings used three different methods (accession year reckoning, non-accession year reckoning, and sole reign after co-reign) of synchronizing Jehoshaphat's reign with his contemporaries and vice versa . Without an in-depth knowledge of these different ways of recounting - one can become thoroughly lost in recreating his years of reign. Hopefully, this chart can successfully bridge the gap of confusion between text and mathematics. So, any opportunity to get this chart in an Excel speadsheet or the like? And, thanks for this image! Love this post and the chart! Like Jerry and Steve, I would love to get the Excel file that this appears to come from. Otherwise, I guess I'll be recreating it myself. Jerry, Steve, and Joe - Thanks for the comments. I am planning on doing some minor changes to the chart - after which I will pass along the excel file and a high resolution image. 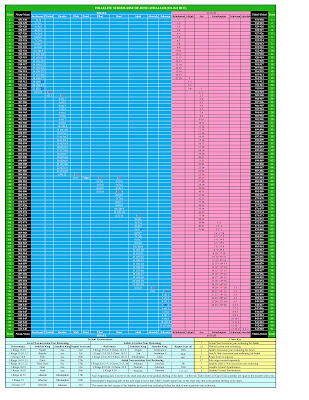 Please send me your email via my email (find on my profile) and I will send the files along after I update the chart.